More vintage excellence and another favourite amongst aficionados, scored (mainly) by Hemant Kumar, famous both as a singer and as a composer. 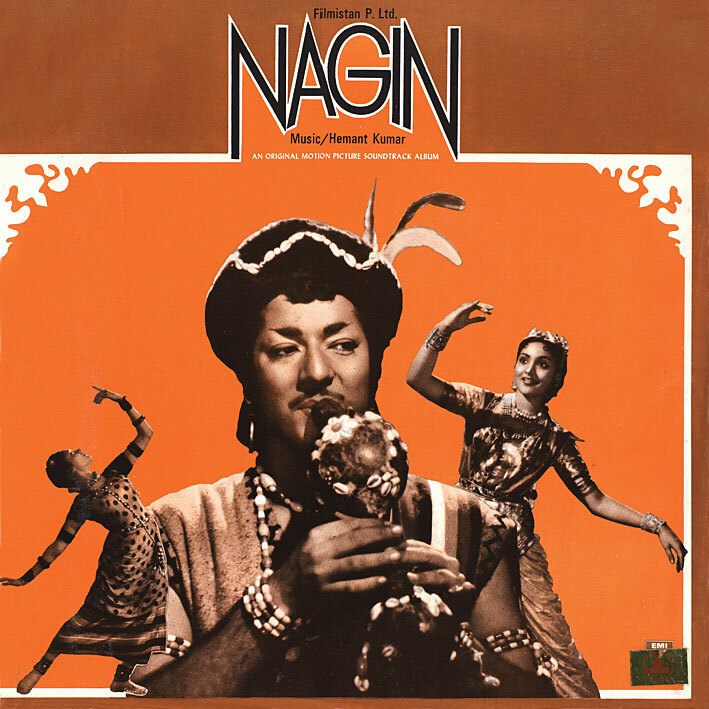 As with 'Detective' (below), 'Nagin' is packed with wonderful, exotic sounding songs, most of them performed by Lata Mangeshkar. 'Sun Ri Sakhi', 'Mera Dil Yeh Pukare Aaja', 'Oonchi Oonchi Duniya Ki Diwaren'... great stuff! The biggest highlight though is the snake charmer track 'Been Music', featuring a young Kalyanji on Clavioline (the very first use of a synth in a Hindi movie) and with a melody apparently composed not by Kumar but by Ravi (another acclaimed music director I've yet to post anything by - but I will). Trippy, haunting, and gliding seamlessly into the lovely 'Man Dole Mera Tan Dole'; it's a stunning double-bill. Youpi!! Thanks for the songs, I love them. This here is a treasurechest of bollyfunk...i soo been looking for a site that shares my interrest and goes to the lenght of ripping good quality audio and artwork for all these gems. Just want to say that your effort is higly appreciated. I take my hat off for you. Agree with Badmash... Thanx for sharing this exquisit music... Would your magical box of 150 bollywod Vinyls, by any chance have two raraties from Kalyanji Anandji: Professor Pyarelal and Soul of bobby ? congratulations and thanks for share all this with us! Professor Pyarelal, yes. Soul of Bobby, no. I wish though. Is this a spilt soundtrack? Which half is '54 & which half is '74. The movie & soundtrack are all from 1954, it's just that this particular LP recording was published in 1974, hence the two dates. Kind of like Detective, which as PC pointed out in his post was made in 1958, but the LP reissued in 1991. The fact that they're droppin synth in 1954 is on Acid before the Beatles. Hey PC...we miss your music. Come on now, and post something for xmas!!! PC, I have been pursuing this awesome site for a couple of days and downloaded a lot of great music without leaving comments as I wasn't sure you would keep track of all the old posts. So I would like to say: Thanks for the music and your effort and time in maintaining this site! This time of year I get the "Asian fever" and starts to plan the next trip to Asia and the music off this site is the perfect sound track. great blog boss. i am going to pilfer some of this stuff later, but get me at my email later, and i'll donate $50 to a charity...you pick...xmas spirit and all that. Cheers! stunning this is brilliant and thanx for all the hard work here..mucho for this ace blog. Gem after gem. I'm rich! I'm rich!